The story is that the game takes place in a Steampunk London during the year 1849. Scotland Yard is about to unveil an unbeatable surveillance system called The Devil’s Basilisk, which will give them complete control and able to stop any crime in the city. You play as the leader of a Thieves’ Guild whose job is to break into Scotland Yard to steal the system before it becomes operation in 100 days. From your zeppelin, you’ll send out your thieves to various places to steal the money needed to buy upgrades and unlock higher security clearance all the way up to Scotland Yard. Each burglary takes up 1 of your 100 days and if you don’t manage to steal the Basilisk in time, you’ll lose. 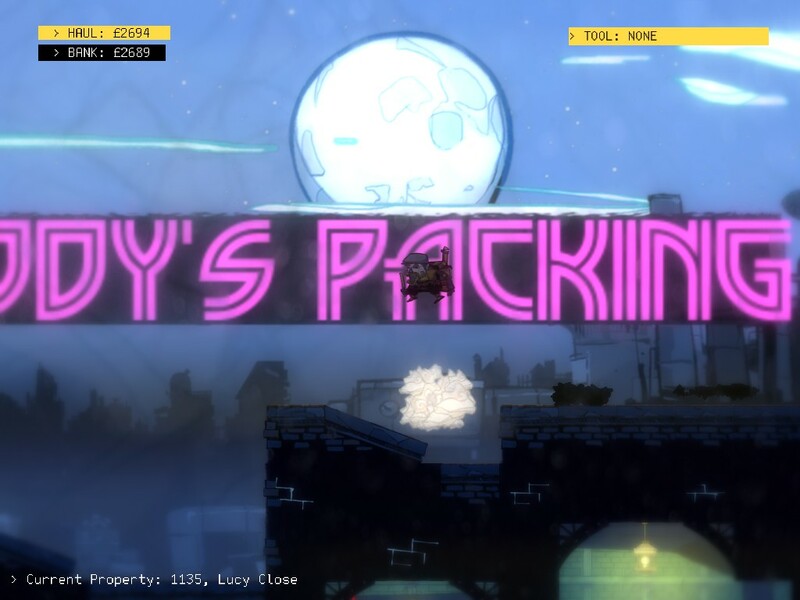 The levels are procedurally generated and are filled with robot guards, security systems and sweet, sweet loot. There is no time limit to clear a level and you can leave whenever you want, however you cannot take any damage from enemies and only loot that you escape with will count back at your base. Each area of the game features different challenges for you to deal with and the added reward of more loot that will allow you to unlock higher tier upgrades. At the start of the game you won’t be able to do much, but you’ll amass a variety of upgrades over the course of a playthrough. This type of progression is great as it provides the player with that “just one more turn” feel to it. Using money as a skill gate is good as it prevents lesser skilled players from moving too fast, while better players can move through the areas very quickly. The challenge of the game is definitely high as there is no margin for error; get caught and you’ll only have a few minutes before Scotland Yard shows up with robot cops and drones. Because of that, a day can take place over vastly different amounts of time; I’ve had some last 20 minutes and others 20 seconds. The control scheme of The Swindle is very responsive which you need for a title like this. 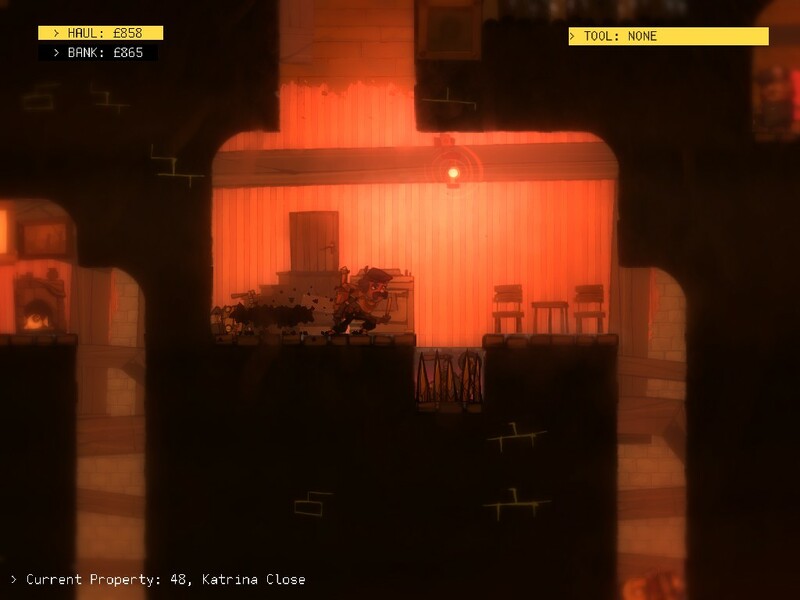 Mastering the use of wall jumping for enhanced movement is vital for some of the trickier level designs. Keeping in line with the upgrade system, your options for movement and agility also grow as the game goes on. Similar to the excellent Mark of the Ninja, The Swindle’s UI and detection system are all visual: Flashlights indicated detection ranges and the game does a good job of highlighting dangers and rewards. To reward players who do well, completing heists with the majority of the money stolen will level up your thief; in turn providing a money bonus on top of whatever you bring back. However if the thief dies, you’ll lose the bonus and will have to work your way back up with another member. Adding to the flavor is a stylish aesthetic and some fun robot designs of the various enemies. Overall The Swindle is a great game and combination of action and stealth design. However, the game’s difficulty may cause some frustration when combined with the time limit mechanic. 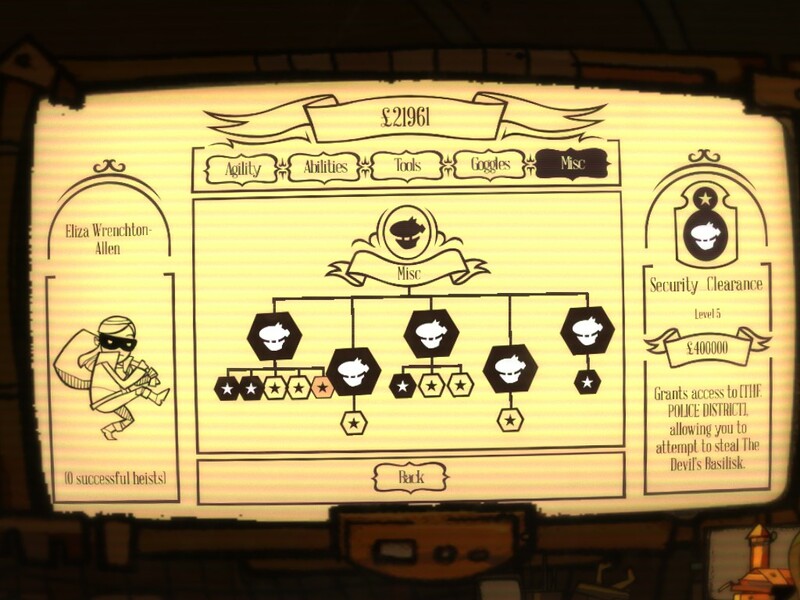 The Swindle’s use of procedurally generated levels is a doubled edged sword when it comes to difficulty and progression. You may have some levels spawned with no safe way to get to the computers which house the most money or the security rooms to disable the majority of the threats. In a normal game this won’t be a problem, but The Swindle has a time limit of the as mentioned 100 plays. That may sound like a lot to you, but given that you will probably have mulligans due to poor luck means that there will be losses out of your control. I’ve had cases where I went at least 8 days in a row without being able to steal anything due to poor luck with level generation. This is also compounded by the final mission where you only have one chance to succeed or you will have to spend another 400,000 for another try. In one play, the level design literally made it impossible for me to win as I didn’t have enough bombs to clear through all the tunnels, despite finding the Basilisk device. Unlike in Spelunky, where the algorithm at play will create a path from the beginning to the end and the items are simply shortcuts, you are required to get all the items to have a chance against the design. I’m all for difficulty, but having the game generate levels with no hope of winning is frustrating. 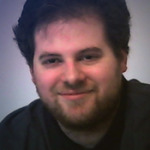 The developer’s take is that the levels are supposed to be unfair, because the tools that you get are unfair. By the end of the game, you’ll be able to teleport around, cause remote explosions of mines and more. This kind of progression that has the player evolving over the course of play shows a distinct difference between early, mid and late game play which is good. However the debatable point about this has to do with how the Meta-Game is set up. Each set of 100 days gives you the exact same upgrades to go for which means that regardless of the procedurally generated levels, there is a set progression in terms of the Meta-Game. What that means is that the overall objective of the game becomes somewhat repetitive and I’m not sure if people are going to want to keep playing after their first 100 days are up. In Invisible Inc that also featured a time limited campaign, the developers had enough variability built into the items and agents you found that it made each play different due to the wide range of strategies possible. During a single play of Invisible Inc, you’re never going to get access to everything and the game instead challenges you to be creative with what you did find. The Swindle doesn’t have that and I would have liked to have seen some kind of random events or unique loot that you could find to help mix things up. 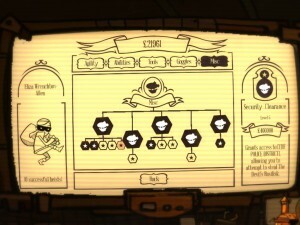 In this way, The Swindle reminds me of how the Meta-Game is set up in a game like XCOM, where you are dealing with a set list of potential upgrades and skills for your squaddies. But the game is different enough each time due to the choices the player has that even having the same options available still give the player a variety of options. From a UI point of view, I would have liked more information regarding some of the items the player can use. For instance there is an EMP item along with bombs and it would have been great to let the player see the range before using them so that they can plan accordingly. Finally I had some issues with fine motions, like getting off of walls or making minute changes and it felt like the game was fighting me. 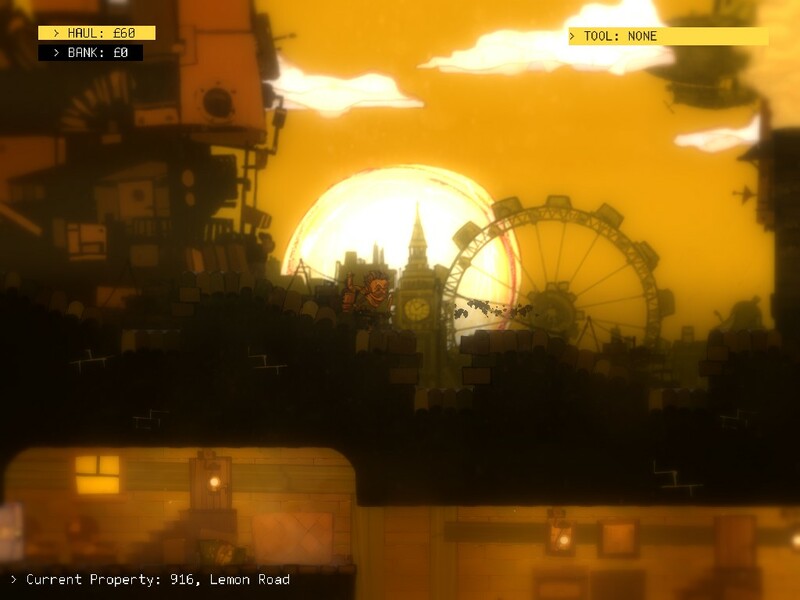 It may sound like I’m coming down hard on The Swindle, but it really is a great game. Combining stealth and action is one of the toughest things to get right due to the polarizing mechanics and The Swindle hits that balance of making the player strong without becoming too powerful. I would love for them to continue growing the game with more challenges and surprises, as the design is strong. Just remember, this is a hard game and as the saying goes: There’s no such thing as the perfect crime. For more information on The Swindle, you can watch my spotlight play of it.